Jeff Johnson, the Republican nominee for governor, provided a glimpse of his leadership style May 15, telling a Tea Party group he would “go all Scott Walker on Minnesota” if elected Nov. 4. 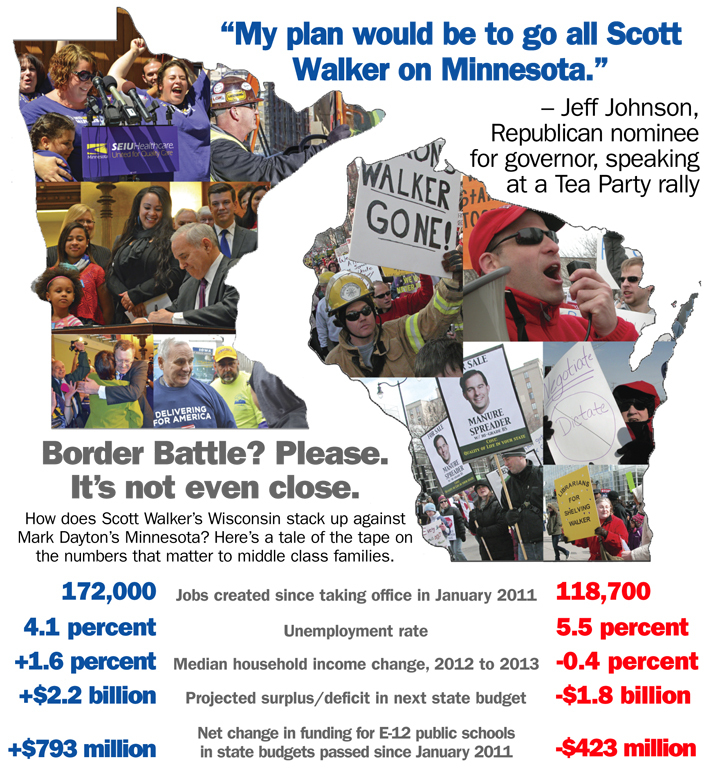 So what is it about Walker’s Wisconsin that Johnson believes is worth replicating? Education. In addition to slashing teachers’ benefits and bargaining rights, Walker cut state funding for public school districts in Wisconsin by $834 million in his first year in office. That’s roughly the amount of new funding the state has funneled into public schools during Dayton’s four years in office. Education Minnesota President Denise Specht, who leads the state’s largest union of school employees, warned that Johnson would lead Minnesota down a similar path. Walker also has expanded Wisconsin’s private-school voucher program, which Specht called “out of control.” According to published reports, the voucher program has funneled $139 million from state coffers into failing private schools over the last 10 years – funds that could otherwise have supported public school districts. Minnesota, meanwhile, is on the opposite path. As a candidate, Dayton pledged to reverse a decade-long trend of dwindling support for Minnesota’s public schools. With help from pro-worker majorities elected to the Legislature two years ago, he signed bills to repay more than $2 billion borrowed from school districts, reduce class sizes and guarantee statewide access to all-day kindergarten.